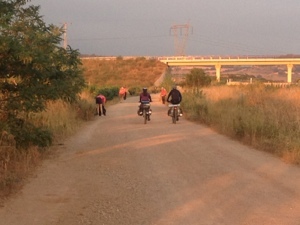 Day 8 was another pretty easy day – about 26km to Azofra. We pretty much had a whole albergue to our gang of five last night, with only one other German bike rider with us in our large dorm. Was great to get a good night’s sleep without snorers or loud talkers! It definitely makes a difference to how we feel in the morning, that’s for sure. 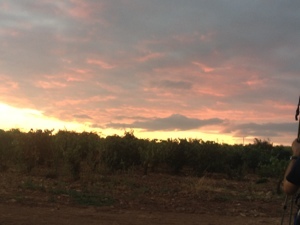 A beautiful sunrise this morning and a day of wandering through more beautiful vineyards – not too hot for the most part, which was great. 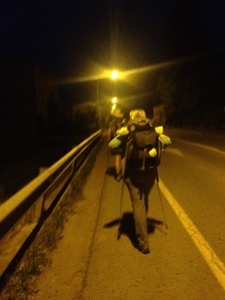 One of our gang, Dave, had an ankle injury that looked like ending his Camino (this is his second), which made us all pretty quiet this morning as he had to walk on in immense pain. Fortunately, he seems to be feeling a lot better and it looks as though he will be able to continue with us. 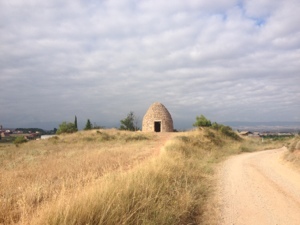 This albergue is pretty great – small rooms of only two beds (with a door for privacy) and a large courtyard with a small pool/fountain – though practical pilgrims have made the courtyard into a washing area, with lots of lines of clothes blowing in the breeze. We calculated an average of 25km per day so far, which is pretty good – we’re walking at a good pace, but stopping to enjoy the sights and food along the way. Hard to believe it’s a week since we left St Jean – sometimes feels like yesterday, but then this routine has become so familiar, it feels like we have been doing it for years! 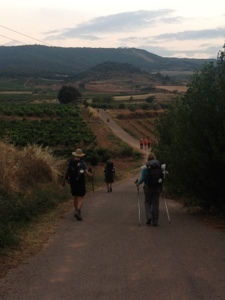 Glad to see that you’re having a great pilgrimage – even if some of you have got off to a blistering start!